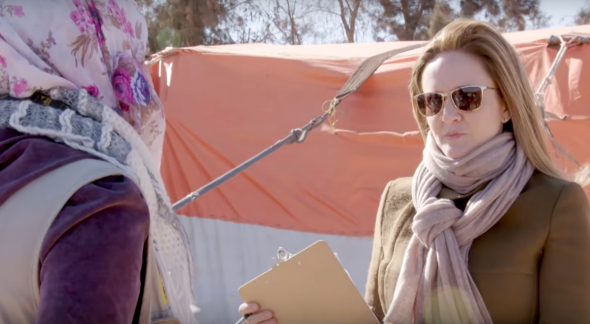 Samantha Bee traveled to Jordan to set the record straight on Syrian refugees (VIDEO). Beloved ex-Daily Show correspondent Samantha Bee’s new late night political satire show Full Frontal made a promising start to its run on TBS on Feb. 8. The Daily Show-meets-Last Week Tonight–style program has only aired two episodes thus far, but if Bee’s brutally honest approach to some of our most serious political issues continues, she might give Trevor Noah and John Oliver a run for their money. This week’s episode of Full Frontal included a brilliant segment where Bee travels to a Syrian refugee camp in Jordan in order to interview refugees and hopefully put human faces on an issue that has attracted some ugly demagoguery. And yes, she actually went to Jordan and didn’t stand in front of a green screen as a throwback to her Daily Show days. The segment begins by pointing out the stark differences between the heartwarming ways other countries welcome Syrian refugees and the apocalyptic frenzy expressed by American pundits and politicians, who seem to believe that every single refugee is a suicide bomber who will auto-detonate the second they step on U.S. soil. Whoever came up with the image of a woman freaking out on a roller coaster to visualize this irrational fear deserves an instant Emmy.